This is a plan of Castlepark fort near Kinsale in Ireland. It dates from around 1611 and is therefore contemporary with the English plantation scheme. This scheme aimed to establish an English colony in Ulster by confiscating land from the native Irish. Several areas throughout Ireland were eventually re settled. It is likely that this plan is the work of Sir Josias Bodley, an engineer by training who held the offices of Superintendent of Castles and Director-General of Fortifications and had been the main surveyor in the first major attempt to calculate the size of the confiscated territories of Ulster in 1609. 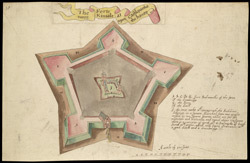 The plan shows a five side pentagonal structure with angular bastions at each of the five corners. The inner structure provides the soldiers accommodation, the two towers store ‘munitions and b[v]ictualls’ A scale of 300 feet is recorded.